This week, we want to saturate the internet with the Strong Towns message. That’s why we’re posting some of our best content of all time and asking YOU to share it. We’ve set a big goal — doubling the amount of new readers on our site in just one week — and we need your help to do it. This is one small but vital step you can take to help build a world of a million people who care about our mission. I wish I had a bus ticket for every time I heard someone say this. Unless you're Manhattan or San Francisco, it is fair to say that you don't have a parking problem. I take that back. You do have a parking problem; there’s too much of it. Here is a quick how-to guide on dealing with those who claim your town lacks adequate parking. The easiest and most time-effective way of convincing your opposition is to have them acknowledge that the perception of parking availability is different than the reality. People come to the conclusion of parking scarcity for a good reason; many live elsewhere and only visit the city during peak periods or special events. This mindset is beautifully captured by a recent Twitter exchange. During the conversation, I asserted that our downtown does not have a parking problem, and a person responded by complaining that parking for his dinner at an upscale restaurant was an unreasonable $20 (the timing coincided with a professional baseball game on a beautiful weekend night). It was either pay $20, or he would be forced to walk from somewhere near the interstate (which happens to be about 5 blocks). This person likely visits the city from the suburbs once every other month, and each visit is probably for an event or dinner on a weekend night. He is not present when spaces sit vacant 90 percent of the time. I recommend politely asking them if they'd be willing to drive and park on a Sunday afternoon, Tuesday evening, or Friday morning. Load up Google Maps, search for your local area, and do a screen capture. Paste the image into MS Paint or a similar program. Start highlighting the open surface parking lots and parking garage structures. Don't spend a lot of time doing this. If you know your downtown, it should be straight-forward. Be honest, but don't nit-pick; this isn't a scientific peer-reviewed study. I've demonstrated this on the left with a map of downtown St. Paul. (This was created in 2013 so it's a little outdated, but still largely accurate). This visual can be shocking. 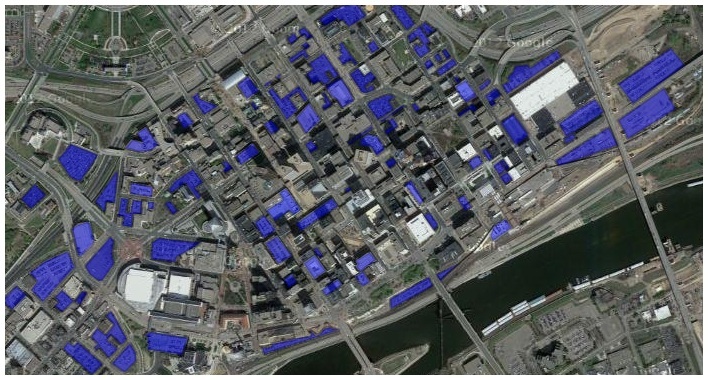 The blue spaces represent only off-street surface parking lots and parking garages, but do not highlight on-street or underground parking. Also, they represent only, to the best of my knowledge, available public parking and don't include private parking spaces. Make this map, share it on social media and email it to your local council member. Walk around your selected area during normal conditions and take photos. By "normal conditions," I mean you shouldn't document supply the evening of a Rolling Stones concert, nor should you snap photos at 4am on Monday morning. I did this in St. Paul's Lowertown neighborhood. I decided upon an early Thursday evening and a Saturday mid-afternoon. I figured these times would capture both commuter parking during the weekday and out-of-town visitors on the weekend. So as to avoid being accused of cherry-picking locations, I encourage you to be fair and also document areas that have cars parked. As a final bit of advice, make sure to also snap photos of people out and about. Do-it-yourself advocacy is as simple as parking. I recommend getting a cheap dashboard camera (or mounting your phone) and recording yourself trying to park. I did this and you can see the results in this video (below). I called it a challenge. It was anything but. As expected, parking was simple. The Rules: Drive to the contested area, take the same route every day, park as close as possible to the most congested spot, and park for free (yes, $0). All of those times included waiting at stop lights. To enhance enjoyment, I added a soundtrack and sped up the video to 2x. Now, this is not an academic study. I merely set out to prove that, under current conditions, a person can drive into Lowertown and park with relative ease, and do it all for free. I also wanted to mention that I’m keenly aware of the limitations of this challenge (e.g. ; time of day, work week, etc.). Follow these three easy steps (and one more time-consuming step involving video) to start combating the perception of a shortage of parking supply in your downtown or neighborhood. These won't solve anything overnight, but they act as a visual display of advocacy that people can relate to. If this message matters to you, share it with someone.